The watch continues for the notorious emerald ash borer, a pest that has devastated ash trees in at least seven states, including neighboring Illinois. The emerald colored bugs appeared near Detroit six years ago and have been advancing toward Iowa. Having seen photos of the emerald ash borer, I quickly reacted when I saw a pretty emerald bug outdoors earlier this summer. Iowa State University has an awesome insect identification program that allows Iowans to e-mail a photograph of their bug and have it identified by entomologists. I shot a photo of my bug next to a ruler to show its size and sent it to the site. Good news: it wasn’t an emerald ash borer. 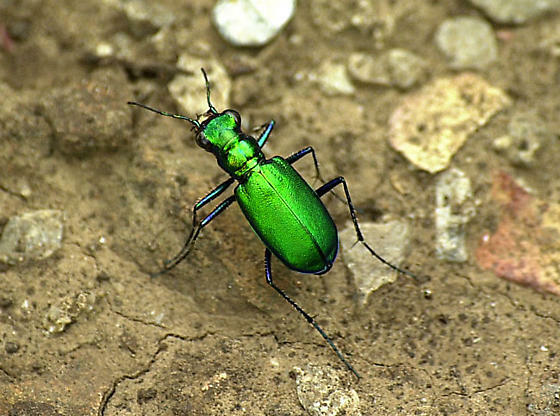 Bad news: I had killed a sixspotted tiger beetle, a beneficial insect that extension entomologist Donald Lewis said is easily mistaken for an emerald ash borer. Lewis tells me the beetles are predators that chase other insects across the ground in woodlands. They hunt food like a tiger. Tiger beetles are ecologically beneficial. They are not a pest. The beetles do not bite, sting or carry disease. They do not feed on crops, trees or houses. They are remarkably fast and difficult to catch. I’m bummed that I caught one, but glad it wasn’t an ash borer. For Iowans who have a bug they’d like identified, specimens can be submitted to the Iowa State University Plant and Insect Diagnostic Clinic for diagnosis at no charge. Specimens can also be sent to the clinic. Include information about where you live, where you found your insect, and how to get in touch with you. Thanks for posting- your blog helps us understand the importance of the six-spotted green tiger beetle. You might want to post a picture of the EAB for comparison. Thank you for your post, Cindy! You helped us identify this little bugger. 🙂 Glad to know it’s not the dreaded Emerald Ash Borer.